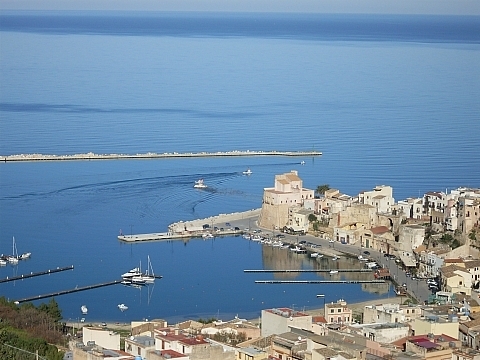 Erice, airport to Trapani " V. Florio" and Palermo. The rooms, spacius and furnished with taste and elegance, are provided with: TV color, mini-bar, air-conditioned; all with bathroom and private balcony. At the last floor you will find a big terrace from wich you can enjoy a beautiful view of the Gulf. Address : via Alberrto Mario,2 91014 Castellammare del Golfo. Language(s) spoken : italiano, inglese. Transfers to and from the airport, rental cars and scooters, boat trips. Excursions in motorboat L. da Vinci or Penelope around the coastline from Castellammare del Golfo S. Vito lo Capo. Guided tours of the various wineries in the province of Trapani, with tastings of local products. Guided tours in several caves of Mount Inici. Guided tours of the Natural Reserve of Zingaro. Possibility to visit the Bath of Segesta, whose sulphurous waters, highly mineralized, perform a therapeutic action. beautiful town of Castellammare del Golfo; at few minutes from the sea and at few kilometres from Segesta, Scopello, the Nature Reserve of Zingaro, Erice, airport to Trapani and Palermo. Nearby town(s) : Scopello: Riserva Naturale dello Zingaro. Segesta, Erice. Airport of Palermo "Falcone e Borsellino". Motorway A29 Palermo-Mazara del Vallo, exit Castellammare del Golfo.